We’d love your help. Let us know what’s wrong with this preview of The Mummy Case by Elizabeth Peters. Disgusted when he is denied access to the pyramids of Dahshoor and assigned to a rubble heap, Emerson finds his curiosity piqued when an antiquities dealer is murdered and a mummy case disappears. Reissue. To ask other readers questions about The Mummy Case, please sign up. So glad I decided to read this series as it just keeps getting better and better. In The Mummy Case we get more of the wonderful Amelia rampaging her way across Egypt with her equally wonderful husband, Emerson. Both characters are larger than life and always entertaining, especially in their dealings with each other. In this episode in the series their son, Ramses, joins them for the first time on an archaeological dig. He adds a whole new dimension to the humour partly because he falls into tro So glad I decided to read this series as it just keeps getting better and better. In The Mummy Case we get more of the wonderful Amelia rampaging her way across Egypt with her equally wonderful husband, Emerson. Both characters are larger than life and always entertaining, especially in their dealings with each other. In this episode in the series their son, Ramses, joins them for the first time on an archaeological dig. He adds a whole new dimension to the humour partly because he falls into trouble at every possible opportunity and partly because he is the smartest child in the known universe. I love the way he interacts with his mother! Of course there are a few murders along the way and Amelia does her usual sleuthing which causes the usual amount of chaos. It is all good fun and I laughed aloud at the best bits. I am already looking forward to the next book. It’s always embarrassing when I have to admit I never realized Elizabeth Peters was a pseudonym for the one and only Barbara Michaels, until about five years ago. When I made that connection, I was determined to get know this side of this talented author. Although Elizabeth Peters wrote two other series, the Amelia Peabody series has to be the most beloved of her characters. This third book in the long running series has Amelia, Emerson, and their aptly named son, Ramses excavating mounds, not where they had wanted to, but in the middle of nowhere. Bored to death with their work, the couple find themselves investigating the suspicious death of an antiquities dealer. After reading the first two books in the series, which I enjoyed immensely, I got sidetracked, and this series fell to the wayside. But, I have been determined to get back on track with it. While Amelia, her parasol, Ramses, and Emerson are as hilarious as always, the mystery was pretty thin, and very slow moving, and while the usual colorful characters are here, they are not as interesting as in the first two books. Still, the banter between Peabody and Emerson is just hilarious, and for that reason alone, this book is worth a read, it was their son, Ramses who stole the show. Now that he is able to join his parents on their excavations, he has adjusted as only a child of Emerson and Amelia would. He still suffers with a slight speech problem, but his disposition is just like his mother’s. It is so funny to see Emerson doting on the boy, while Amelia is not moved by his cuteness, staying firm and practical as a mother. This dynamic made the books a lot of fun to read. But, don’t give up on the mystery. The last three chapters or so are pretty quick paced and there is a bit of action and adventure involved. Once again the author, who has since passed away, did an excellent job of drawing upon her own experiences as an Egyptologist to give the reader a very detailed and authentic description of the areas Peabody visits. Told from Amelia’s first person perspective, in the form of journals, we get a well-rounded story that is humorous, unique, and delightful. “Catastrophically precocious”—this is how Amelia Peabody Emerson describes her young son, Walter Emerson (better known as Ramses, for his demanding nature). Several times during this novel, a chill runs down her spine when she wonders just where her darling son is and what mischief he has found in which to embroil himself! The fact that the author herself is an Egyptologist really makes these books fun. She uses all the historical archaeologists as characters for Emerson to roar and bellow at whe “Catastrophically precocious”—this is how Amelia Peabody Emerson describes her young son, Walter Emerson (better known as Ramses, for his demanding nature). Several times during this novel, a chill runs down her spine when she wonders just where her darling son is and what mischief he has found in which to embroil himself! The fact that the author herself is an Egyptologist really makes these books fun. She uses all the historical archaeologists as characters for Emerson to roar and bellow at when he is not debating archaeological issues with vicious thrust-and-parry. I still love Amelia, armed with her parasol, seeking out clues. Ramses is lawyer-like in his reasoning, endeavouring to manoeuvre around her prohibitions. But “da cat Bastet” really steals the show in this installment—somehow I picture her as a haughty Siamese. The Mummy Case is the third novel in the Amelia Peabody series and once again we open with the Emerson’s in England. They plan to return to Egypt and dig at the pyramids of Dahshoor, leaving behind their precocious son Ramses with Emerson’s brother Walter and his wife Evelyn. Evelyn has just suffered a ‘disappointment’ (miscarriage) and having Ramses comforts her. Plans are thwarted when Evelyn falls pregnant again and even Emerson and Amelia can see that it will be impossible for them to leave The Mummy Case is the third novel in the Amelia Peabody series and once again we open with the Emerson’s in England. They plan to return to Egypt and dig at the pyramids of Dahshoor, leaving behind their precocious son Ramses with Emerson’s brother Walter and his wife Evelyn. Evelyn has just suffered a ‘disappointment’ (miscarriage) and having Ramses comforts her. Plans are thwarted when Evelyn falls pregnant again and even Emerson and Amelia can see that it will be impossible for them to leave Ramses behind as he is far too much of a handful for someone in such a delicate condition. After some deliberation they decide that Ramses is at last old enough to come to Egypt, providing they take along one of their servants, John, to look after him. 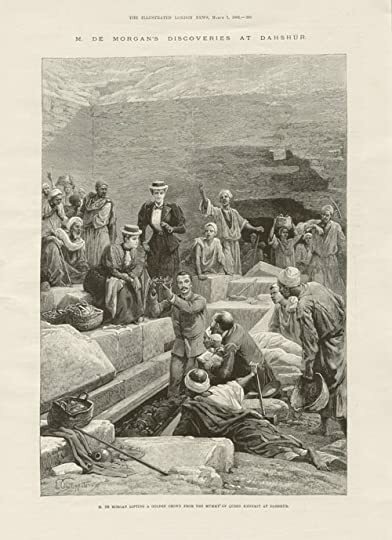 Emerson is denied the dig he requests and is instead given the insulting location of Mazghunah, with periods in a state of disrepair and littered mostly with late-period graveyards, not at all Emerson’s expertise or preference. Because of his irascible temper, Emerson usually gets on the wrong side of those that give out the digging permits and this unattractive location is clearly destined to bring him down a peg or two. However before they can even arrive at their site, Amelia and Ramses visit an antiquities dealer in Cairo, and become caught up in a scam of illegal antiquities dealing. Amelia is looking for papyri for her brother-in-law Walter and just happens to enter the shop during the time of a suspicious conversation, which she interrupts. She manages to get the antiquities dealer to co-operate and tell her what is going on if she returns at midnight that night. When she and Emerson do return, they find the shop proprietor hanged. Out at their digging site, Amelia is disturbed to recognise one of the workers that has been hired – she is convinced that she saw him in the antiquities shop and that he is involved somehow. She unfortunately involves Emerson straight away, who dismisses her suspicions as foolish and ends up alerting the worker to the fact that Amelia is curious about him. Emerson is determined for Amelia to forget her ‘silly detective ideas’ but too many strange things are going on at their new digging site for Amelia to really do this – someone attempts to steal something from Ramses’ room, a tourist docked nearby on one of the dahabeeyah’s has a Mummy stolen, switcheroo’s are played with that stolen mummy case and others Emerson has recovered from his dig. Add in two religious sects in the local village fighting to convert and claim the locals as their flock and Amelia has plenty to keep her occupied. I really enjoyed the first two novels in this series but this one didn’t really do it for me and I think I can pin that down to two particular reasons. The first reason is that this one was incredibly slow to get going. I normally read an average paperback in a day or two but it took me at least a week with this one, I just could not stay interested. After some 200 pages, I have to admit I was still totally unsure of what the big mystery/drama was even going to be. The narrative is extremely dry, which hasn’t bothered me in the previous two because I think Amelia is a great teller of a story (the books are all written in first person) even though her brusque manner and dry tone could be trying to some. I enjoyed it up until now but this novel it just seemed like it was endless pages of Amelia talking but saying nothing at all. We rehashed how amazing and fabulous Emerson is and how he’s a fine speciman of a man who still can’t keep his hands off his wife (but don’t expect details, this is Victorian times, you won’t get any) and we talked an awful lot about how passionate they are about digging up the vast majority of Egypt and how Emerson is very bad-tempered and rude to people and then wonders why he doesn’t get good locations to dig up. The other problem? Ramses. Their young child with several annoying speech impediments who speaks like a 35 year old PhD student in Egyptology and Archeology as well as Religious Theory and Just About Everything Else Under The Sun. I’m sorry I don’t care how intelligent some children are, Ramses is just completely unbelievable and so thoroughly annoying that I found myself skipping huge chunks every time he appeared and especially when he opened his mouth – which was far too often. Emerson dotes upon him and peers at him through rose coloured glasses and while Amelia seems thoroughly aware of how irritating Ramses actually is, cutting him off just about every time he takes a breath ready to deliver a lecture on well, anything, she doesn’t actually make much of an attempt to rein him in. He seems to outwit her at pretty much every turn with a “but Mama you didn’t tell me not to do this” which would really have me gagging him with duct tape if he were my child. And in the end of course Ramses saves the day despite the fact that he’s about six years old. This is the third book of the series and commences the year after Radcliff and Amelia Emerson came out of retirement. Together, they decide to take their amazingly precocious child with them on a dig in the pyramids of Egypt for the winter season, where they a . This is the third book of the series and commences the year after Radcliff and Amelia Emerson came out of retirement. Together, they decide to take their amazingly precocious child with them on a dig in the pyramids of Egypt for the winter season, where they are personally acquainted with may of the locals. This child is so advanced, that he knows as much about the dig as his highly educated parents, which is totally unbelievable, but extremely entertaining. It produced such a comically, vivid picture of this family with their superior attitudes, geological adventures, and warped mysteries. that it had me laughing out loud. I have finally found a clean book series that provides wit, humor, and tons of new words to devour. This historical romance inspires clean and wholesome entertainment with a cast of quirky characters working together to catch a murderer and solve this historical mystery at an excavation of an ancient Egyptian tomb, filled with Egyptian antiquities. This time the willful and witty duo, comprised of Radcliff and Amelia, are involved in catching another murderer at another excavation of an ancient Egyptian tomb, where they also contend with the antics of their precious son, Ramses. This is a historical romance that inspires clean and wholesome entertainment, bringing Radcliff and Amelia Emerson out of retirement. Each book in the series is a stand-alone mystery which can be read without previous knowledge. However, the characters age throughout the series and events in previous books (including spoilers concerning some of the main characters) are referenced in later books. I am enjoying this clean book series immensely, I thoroughly enjoyed soaking up the wit, humor, and tons of new words waiting to be devoured. In my opinion, any romantic insinuations were referred to as charmingly in a discreet manner. Although this book does not always follow the social protocol, instead of taking leaps in many directions, the entertainment delivers great entertainment. The sparkling gems of dry wit were fabulous and plenty to be had! Oddly enough, there will most assuredly be reviews all over the chart for this writing, depending on the different perspectives from multi-faceted readers. You may be interested in more of this author's many other novels in the future. She writes under her pen names Elizabeth Peters, Barbara Michaels, and her real name - Barbara Mertz. Each time I read a new book in this series, I fall in love with the characters more and more. Amelia & Emerson are one of the best couples in fiction and I end up laughing so much, that I usually bookmark half the book. As usual with the series, this book is set in an archeological dig in Egypt but for the first time, the Emersons have brought their precocious son Ramses. Soon enough, Amelia & Emerson find a dead body which Amelia cannot leave well enough alone. Emerson and Amelia are a Each time I read a new book in this series, I fall in love with the characters more and more. Amelia & Emerson are one of the best couples in fiction and I end up laughing so much, that I usually bookmark half the book. Emerson and Amelia are a very singular couple, with a perfect understanding of one another. Not only that, but they are madly in love with each other and it shows. Emerson's tastes in this area, as in most others, are highly original...and his remarks about my figure, which is unfashionably slender in some areas and overly endowed in others, cannot be reproduced, even here." I'm totally in love with Emerson, who is a most devoted parent (unlike Amelia, who is constantly suspicious of Ramses). At some point, Emerson - who is super irascible - is told to apply the tenets of the Bible and keep his wife silent. His response? A roar of laughter. He's not threatened by his wife and he likes the fact that she's strong and opinionated. And not only is Emerson extremely bright and clever, he's also a hunk of a man! "He's a very handsome man, your husband. "Mucho macho" as the Spanish would say." The mystery at the end turned out to be too convenient but the dialogue was so clever and funny that I really didn't care that much. Amelia Peabody is back! Yay! She and Emerson haven’t gotten the dig they were hoping for. Instead they feel like they are working on a trash heap. So a bored Amelia looks for trouble and finds it. Since I’m a character reader, I’ll take that route. Amelia is a bluestocking. She loves to be in control of everyone and everything. Her favorite things to try to control are the men in her life. The Amelia Peabody is back! Yay! She and Emerson haven’t gotten the dig they were hoping for. Instead they feel like they are working on a trash heap. So a bored Amelia looks for trouble and finds it. Amelia is a bluestocking. She loves to be in control of everyone and everything. Her favorite things to try to control are the men in her life. They, of course, are hard to control. Especially their 4 year old son, Ramses. Now having been an adventurous little girl and having spent time as the mother of an adventurous little boy, I can sympathize with Amelia’s parenting. Like Ramses, my son would work his way around whatever rules I put out. Who would have thought I would have to tell a 4year old it was against the rules to climb out the window of his second floor bedroom so he could sit on the roof? But Ramses really reminds me of my 4 year old grandson, Mr. H. The long lectures on scientific stuff is all Mr. H. He is still determined that Pluto needs to be a planet. Don’t be surprised if someday his arguments win and it changes back. It has been decades since I’ve read any of the novels by Elizabeth Peters. In the 1970s and 1980s they were among my chiefest delights when in the mood for light reading—though her Egyptian novels were always the ones I liked the least. Her heroines were pure liberation for a young woman born in the 1950s, swashbuckling and self-confident, cutting themselves a swath through the world. I found myself a little less amused this time around, though Amelia Peabody is still a delightful character (to r It has been decades since I’ve read any of the novels by Elizabeth Peters. In the 1970s and 1980s they were among my chiefest delights when in the mood for light reading—though her Egyptian novels were always the ones I liked the least. Her heroines were pure liberation for a young woman born in the 1950s, swashbuckling and self-confident, cutting themselves a swath through the world. I found myself a little less amused this time around, though Amelia Peabody is still a delightful character (to read about, at least, not necessarily to know personally). This story (I believe the third in the series, so don’t read on if you haven’t read any of them and think you want to) finds her married to her Emerson and bringing her precocious son Ramses with her for his first digging season. As usual, murder, mayhem, and mystery surround her and she must divide her focus between archaeology and detection. Definitely my least favourite of the series so far, primarily because so much of it focuses on Christianity with so little understanding. The view Peters takes of late 19th-century missions in Egypt doesn't jive with what I've heard before in other places about the very real social services they provided; the dismissal of the 3,000 or so years of Egyptian history since the pharoahs seemed snobbish; and the idea that a scrap of a gnostic gospel would be at all challenging to sincere believers is, Definitely my least favourite of the series so far, primarily because so much of it focuses on Christianity with so little understanding. The view Peters takes of late 19th-century missions in Egypt doesn't jive with what I've heard before in other places about the very real social services they provided; the dismissal of the 3,000 or so years of Egyptian history since the pharoahs seemed snobbish; and the idea that a scrap of a gnostic gospel would be at all challenging to sincere believers is, frankly, hilarious. Personally as a writer, even though I have definite opinions and beliefs of my own, I would never want to provide such a one-sided and dismissive treatment of someone else's religion. This book is only meant to be a light comedy, but a better author would have written with more grace and nuance. This 3rd book in the Amelia Peabody series was a huge disapointment. The first two were hilarious and fun to read, despite the weakness of a having a pretty vague or unremarkable mysterie at their core. Peters seems to not have had much of a thought as to who the perpetrators or the mytery should be whe sitting down and writing this book. It feels like at the end whe we find out what was going on and who the villains are, she is half heartedly trying to fit the persons in as the criminals rather This 3rd book in the Amelia Peabody series was a huge disapointment. The first two were hilarious and fun to read, despite the weakness of a having a pretty vague or unremarkable mysterie at their core. Peters seems to not have had much of a thought as to who the perpetrators or the mytery should be whe sitting down and writing this book. It feels like at the end whe we find out what was going on and who the villains are, she is half heartedly trying to fit the persons in as the criminals rather then having built the story from the start with them in mind as the perpetrators. I had a hard time staying engaged with this book. It took a long time to get going and nothing really remarkable happaned through out the book. Amelia was actually a bit annoying in this book, very pompus and repetitive, especially when it came to her husband and their relationship. Their kid, Ramses was incredibly annoying and hard to believe. Several times throughout the book I felt the boy should have gotten a good spanking or at least be cuffed to his bed. The way his speech was writen was really starting to grind my nerves and the fact he rarely got to finish what he was saying was almost worse. It just doesn't get any better. And I don't mean that as a complimentary phrase. Someone told me that vol 3 was much better than vol 2. It is not. It's worse. Not even listening to it as an audiobook helped. Barbara Rosenblat underwhelmed me greatly as the reader, with her horrid rendering of the despicable little dwarf Ramses, and making Amelia sound as arch as the St Louis monument. Again, I was too busy to stop and delete it, so I bore with it. Ehhhh. Who takes a four-year-ol Oh, dear. Who takes a four-year-old on an archaelogical dig? Even a four-year-old who acts and talks like a 54 year old? Especially a turn of the century English family. No, dear, he would have been packed off to boarding school, or foisted onto his godparents. Because, the constant Christianity-ridiculing in this book notwithstanding, the unbearable "Ramses" does have Anglican godparents. But no--we are subjected to the insupportable little Gary Stu at every turn. And if I hear "the cat Bastet" one. more. time....I really will not be responsible for my actions. A child would humanise his pet and call it by its name...but then nasty little Ramses is anything but a normal human child. I think he's a kobold. Only once, or at the most twice, is it called "the cat", but never "Bastet". Always, unaccountably, "the cat Bastet." Ugh. I've had pets most of my life. You refer to them as "Rover" or "the dog" or "Fluffy" or "the cat." I've read 19th century family stories since I could read, and none of them referred to their pets as "the dog Rover" or "the cat Fluffy" in every sentence. It's obvious to me that Amelia doesn't even like her son much. Frankly, I see her point. The big pyramid adventure was almost fun, in a Perils of Pauline sort of way, but Peters took faaaaar too long getting there. Instead she self-indulgently presents this volume as a "secret diary" only to be revealed after the authoress' death--why? To allow Amelia to give free rein to her pomposity? The device served no narrative purpose, rather the reverse, because it meant she padded the book out with all kinds of extraneous characters and subthreads. There are lots of first-person novels out there that don't present themselves as diaries (the first two in this series, for example). I got the impression the authoress really wasn't sure where she was going, which was odd, as the entire thing was so ridiculously predictable from Chapter 2 on. I like this series - I really do. I bought some of them on sale on Audible and they work for me when driving on road trips. Time passes quickly when you aren't thinking with your 6yr old self - "when will we get there? ", "are we there yet?". I find myself speaking in a slight upper crust English accent when I arrive at my destination. The dry humor has me chuckling and I like the insights into ancient Egypt, culture, etc. So why 4 stars? I loved the narrator in book 1 - she nailed both Ameilia's and Emerson's voices. Book 2 - they changed narrators and I was not a fan of the her performance. In book 3, the narrator from book 2, tries this as if Amelia is reading her memoirs, and while I could accept Amelia's voice (kind of), she made Emerson sound like Nigel Bruce's Watson in the old Sherlock Holmes movies. Ugh - it is not Emerson - even older. I first picked up this series on the recommendation of a friend because of my love for Gail Carriger's Soulless. I can see the similarities, minus supernatural creatures, but I've never liked this series quite as much. And of a series that I've thought to be entertaining enough, but not great, this was the worst of the lot so far. Now, I do mostly like Amelia and Emerson. Their love/rivalry thing is kind of cute, and the banter is cute, but it got a bit wearying by the end that they're just consta I first picked up this series on the recommendation of a friend because of my love for Gail Carriger's Soulless. I can see the similarities, minus supernatural creatures, but I've never liked this series quite as much. The biggest character issue I had in this book, though, is Ramses, the "catastrophically precious" 8-year-old who spouts out encyclopedic entries and constantly dictates and lectures to everyone. I do, however, like the cat Bastet. But, at the end of the day, that's not really did this book in. It was mostly the fact that the case was just completely uninteresting to me. It didn't feel like it had any real stakes, I didn't care that much about any of the major players, and just didn't really care about much of any of it, to be honest. The five-star scale is unsatisfactory and should change to ten. I give three but this novel is superior to others that have received that designation from me. It doesn't reach four stars because Ramses, estimated at six years-old, was annoying and this mystery merely happened arbitrarily around us. Its theme was Amelia's compulsion to sleuth. There wasn't even any archaeological coup, just a lovely look at the family, including loyal and intelligent cat Bastet, whose constant presence I certainl The five-star scale is unsatisfactory and should change to ten. I give three but this novel is superior to others that have received that designation from me. It doesn't reach four stars because Ramses, estimated at six years-old, was annoying and this mystery merely happened arbitrarily around us. Its theme was Amelia's compulsion to sleuth. There wasn't even any archaeological coup, just a lovely look at the family, including loyal and intelligent cat Bastet, whose constant presence I certainly approve. There are wonderful moments between Amelia and Radcliffe. The ultimate crux of "The Mummy Case", an explosive religious text that was discovered in real life, was neither foreshadowed nor built-up at all. The denouement of this mystery could have inserted any character and any back story, into the explanatory pages. No plotting leaned adeptly in any direction. The story comprised suspicion and mishaps, as if leaving an opening for Elizabeth Peters to eventually decide to whom she would attribute them. This is a nice excursion, well-written in terms of humorous dialogue and narrative but not a tautly-plotted case. I would prefer seeing more of Evelyn, Walter, and their children freshly augmented to five. Amelia's intolerance of Ramses' know-it-all ravings bring me laughter and I love that there is no sting in the family's civil address of one other. Quite a bit less engaging than the first book, The Mummy Case suffered very badly from an overdose of pompousness. From Ramses stilted sentences, and seriously WHAT 7 or 8 year old child sounds like a 50 year old college professor (and the speech impediment was just freaking annoying) to Amelia and even Emerson, whom we expect to be stuffy. Amelia's narrative bordered on self righteous and I rapidly tired of her know-it-allness. Not to mention she spent most of the book cutting off every male wh Quite a bit less engaging than the first book, The Mummy Case suffered very badly from an overdose of pompousness. From Ramses stilted sentences, and seriously WHAT 7 or 8 year old child sounds like a 50 year old college professor (and the speech impediment was just freaking annoying) to Amelia and even Emerson, whom we expect to be stuffy. Amelia's narrative bordered on self righteous and I rapidly tired of her know-it-allness. Not to mention she spent most of the book cutting off every male who dared to open their mouth and speak in her presence. And I have to say her treatment of Ramses, even for a time period of greater strictness and more formality, was down right emotionally abusive. It had all the usual funnies I expect from an Amelia Peabody book but the plot was very confusing. I don't think I understood what happened, maybe the characters didn't either! Gotta love Peters for her romantic heroes and in-depth knowledge of Egyptology. Such book-candy. Even though it's pretty much the same formula as the first two books, I still found it an entertaining and delightful read! I adored the continued banter and antics of Peabody and Emerson. Ramses is such a doll, and I find him to be a much beloved addition. I plan to continue listening to the series as a palate cleanser. 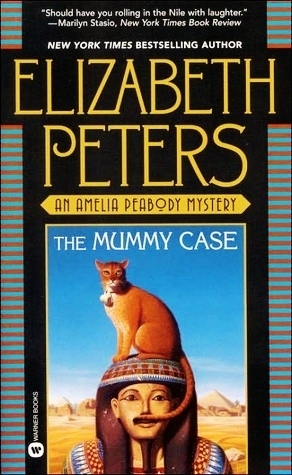 Last year I started to read the Amelia Peabody series by the late Elizabeth Peters, and discovered that I liked it. In the third book in the series, the Emersons are returning to Egypt, but this time they have their young, precocious son Ramses in tow, along with the cat Bastet. Assigned a distant, unremarkable site to excavate, the digging season starts out uncomfortable, but soon enough there are plenty of eccentricities to complicate matters, from several American missionaries, an overstuffed Last year I started to read the Amelia Peabody series by the late Elizabeth Peters, and discovered that I liked it. In the third book in the series, the Emersons are returning to Egypt, but this time they have their young, precocious son Ramses in tow, along with the cat Bastet. Assigned a distant, unremarkable site to excavate, the digging season starts out uncomfortable, but soon enough there are plenty of eccentricities to complicate matters, from several American missionaries, an overstuffed overbearing German baroness who fancies herself an ancient Queen, and something peculiar about a coffin. But it is Ramses who is the real star of this novel who keeps finding more trouble and dirt than any young child should. Great fun, real archaeology, and a painless way to see the birth of modern Egypt. Four stars overall and recommended. I LOVE these books. Embroiled with history and a little mystery, these books will keep you chuckling as you go thro Peabody and Emerson are hoping for a quiet dig season, but with their son Ramses along for the ride, nothing is going to be quiet.. ever! My experience of this third book in the Amelia Peabody series was a combination of reading it on Kindle and listening to the audio book narrated by the marvelous Barbara Rosenblat. These books are pure fluff and fantasy. I wasn’t sure if I wanted to continue with the series after reading the second book, particularly because I found Emerson annoying, but my sister suggested trying the audio and I think she was right that this is the better way to consume these books. Barbara Rosenblat lends the n My experience of this third book in the Amelia Peabody series was a combination of reading it on Kindle and listening to the audio book narrated by the marvelous Barbara Rosenblat. These books are pure fluff and fantasy. I wasn’t sure if I wanted to continue with the series after reading the second book, particularly because I found Emerson annoying, but my sister suggested trying the audio and I think she was right that this is the better way to consume these books. Barbara Rosenblat lends the narration just the right touch of levity and timing. In their third outing, Peabody and Emerson take their young, precocious son nicknamed Ramses with them to Egypt. I liked Emerson’s sentimental paternal feelings towards his son. Peabody treats him generally with a certain degree of coolness, even though he resembles her in character very much. Even though I cannot relate to Amelia's parenting style in the least - these are still highly, highly entertaining books!!! Love them!! Amelia and Emerson are back in Egypt, along with their overly precocious son Ramses and the cat Bastet. Since Emerson refused to apply for a firman in advance, De Morgan, the director of antiquities has already chosen the pyramids Emerson had promised Amelia. Emerson's hot temper got him reduced to excavating a Roman cemetery and flattened pyramids. The Emersons are also beset by missionaries and are kept on their toes keeping their son out of trouble. Walter has requested papyri and when Amelia Amelia and Emerson are back in Egypt, along with their overly precocious son Ramses and the cat Bastet. Since Emerson refused to apply for a firman in advance, De Morgan, the director of antiquities has already chosen the pyramids Emerson had promised Amelia. Emerson's hot temper got him reduced to excavating a Roman cemetery and flattened pyramids. The Emersons are also beset by missionaries and are kept on their toes keeping their son out of trouble. Walter has requested papyri and when Amelia visits a somewhat less shady antiquities dealer in Cairo, he claims he doesn't have any papyri, but Amelia senses he's lying. She had spotted an unsavory character speaking with the dealer only hours before she discovers the man dead. Ramses discovered a Coptic papyrus in the shop and took it to study the language. While on their expedition, the Emersons discover a rash of unusual break-ins and a missing mummy case that keeps appearing in the oddest places. Amelia is convinced the events are connected and there's some Master Criminal behind the operations. Emerson is certain it's just a coincidence. Who will prove correct? Amelia is wonderful as always. She's logical and analytical but feminine enough to smell a love triangle a mile away and want to interfere. I love her with Emerson but this book lacked a lot of the witty banter from the previous books. They still banter and they still value their alone time but having Ramses along changed the tone of the relationship aspect of the story. Emerson's hot temper annoyed me and like Amelia, I think he should have let her handle things. Ramses annoyed the heck out of me. I hate overly precocious children in novels and having a precocious 6 year old in the house as a benchmark shows me that Ramses is completely unrealistic. He provides a lot of comic relief though. I especially enjoyed his new pet! The secondary characters were a mixed bag. John was interesting and funny, especially when he forgot his vowels. Like the Emersons I did not like the missionaries. Brother Ezekiel was especially annoying and I think if I were Emerson I would not have been so polite and if I were Amelia, I would have rescued Charity. Charity has all my sympathy and my heart went out to her. She's a victim of abuse from her religious zealot brother who forces her to essentially be his slave. I hated every scene she was in and was hoping for a different ending. Brother David surprised me a lot. I didn't like him very much but was also expecting something a little different from his plot. The baroness provided some comic relief and advanced the plot but was largely unnecessary.